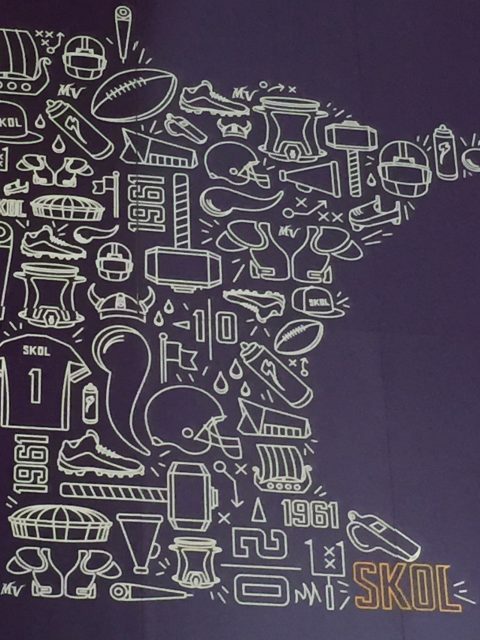 The 2016-17 football season was the first year for our beloved Minnesota Vikings to play in their brand-new, nearly 1 billion dollar facility in downtown Minneapolis! 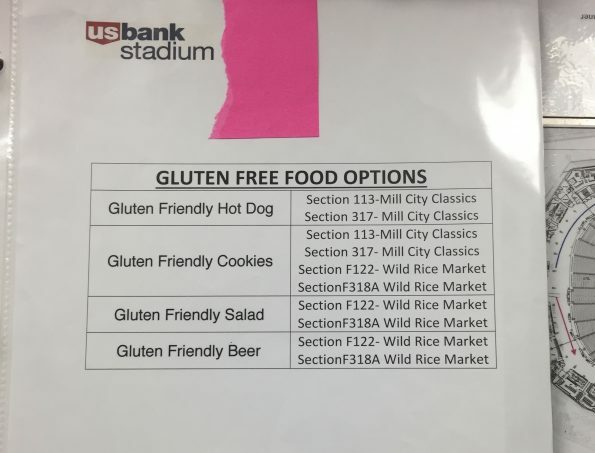 For spending so much money on this beautiful stadium (and how much time and effort they put into the food options there) they have very few gluten-free, and even less celiac-friendly options. They do have some but it’s not extensive or special in any way shape or form. There is gluten-free beer and wine so I guess that’s good! 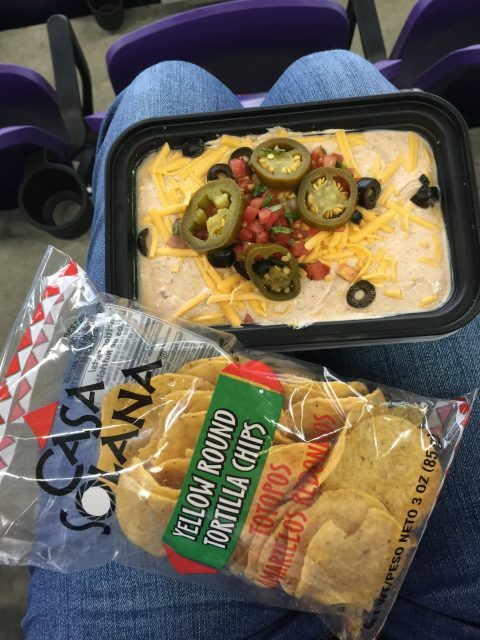 I was able to go to two games before my Celiac Disease diagnosis so I got my fill on all the awesome food and drink options. Just Brian and I went to the game this year and we got there really early to walk around and explore our options for food. I’ve probably mentioned this before, but Brian eats gluten-free in the home and when we are out together so that I don’t feel bad – isn’t that sweet of him! Not much there, right? 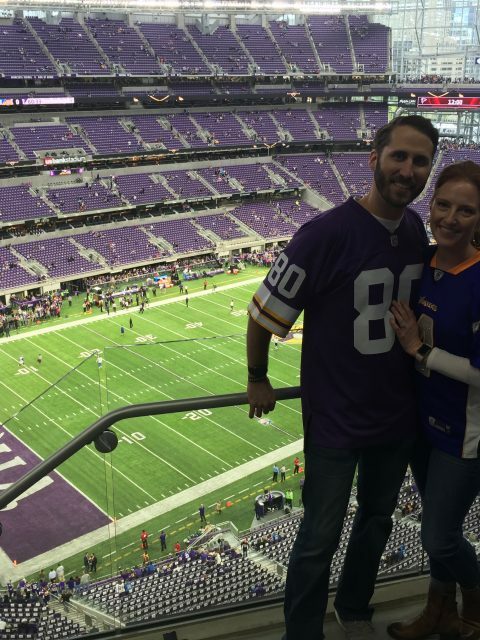 This is also available on the MN Vikings/US Bank Stadium webpage. 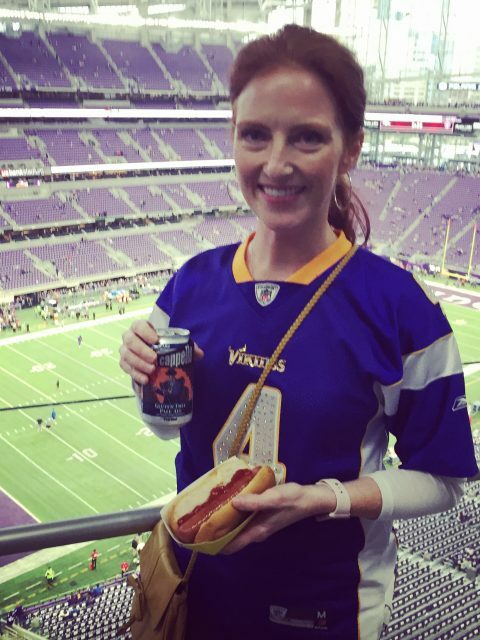 Here is my breakdown of all the (mostly) celiac-friendly foods at US Bank Stadium! Mill City Classics: There are multiple locations on levels 1 and 3. 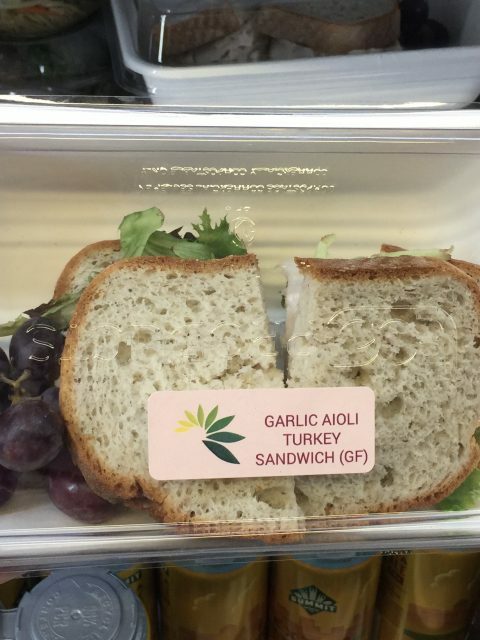 Some have the “gluten-friendly” hot dog and bun (it will be noted on the menu). The bun is the tapioca bun from Ener-G. It is dry and cold, but it does the job. I believe the hot dog brand is Schweigert and they are technically gluten-free. BUT, they are on the same warming roller as the bratwurst which is NOT gluten-free. And the volunteer workers at these stands have zero training in celiac-safe handling of the food. 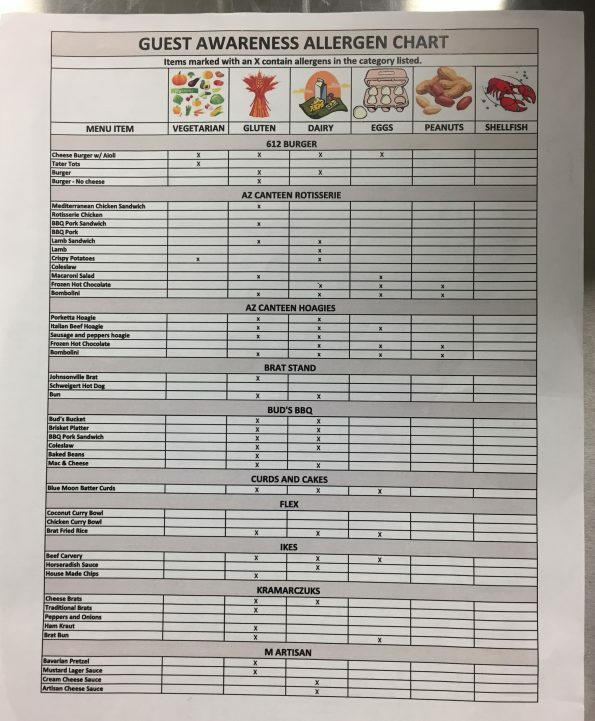 So, I asked that they change their gloves, use their fingers to take the hot dog off the roller instead of the contaminated tongs, and asked that they took the hot dog from the far side, as far away from the brats as possible. I would also suggest to get there early before it gets so crazy busy that they won’t be able to truly take their time to listen to you and help you. 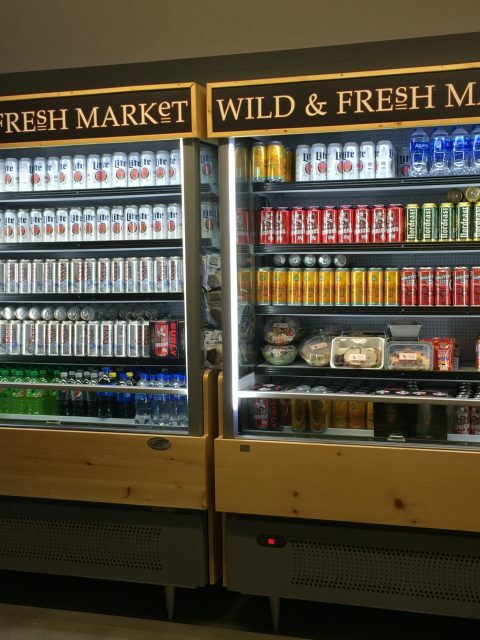 Mill City Classics did not have any other gluten-free options. They had nachos with the cheese sauce the oozes out of the machine, but I asked to read the box with the ingredients and there is so much stuff that I couldn’t pronounce that I wouldn’t want to eat it anyway. It’s also not on any of the lists provided by the stadium so that should say something. I did not see any cookies anywhere at any of the booths. And none of the employees mentioned that as a gluten-free option. Wild Rice Express: This is where they have the A Capella sorghum IPA beer. We loved it. 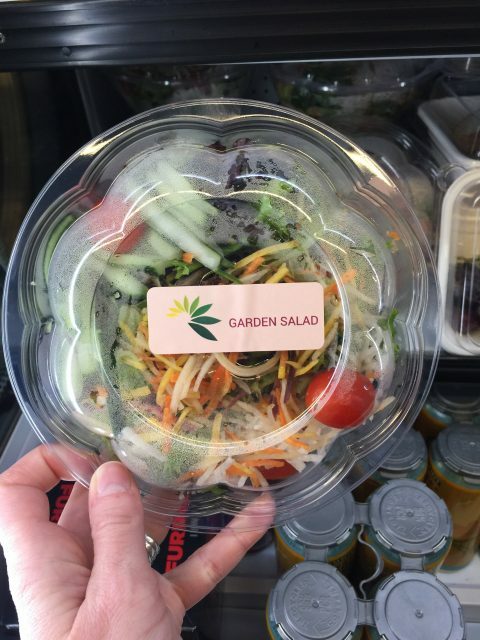 They also carry the taco dip with corn chips, a gluten-free sandwich, and a salad. 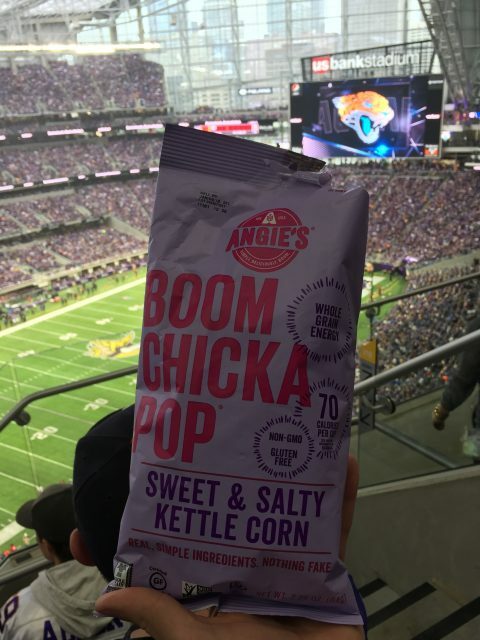 They have the pre-packaged Boom Chicka Pop kettle corn. We got 2 bags! We didn’t find any other kinds of gluten-free beer. They do carry Redd’s Apple Ale – but that is just regular ol’ beer. Don’t drink that! I also searched all the bars and they do NOT have Tito’s vodka, which is corn based. They must have a partnership with New Amsterdam vodka which is probably gluten-fee after the distillation process, but I don’t want to chance it. There is another booth called 612 Burger. They basically have burgers that come with tator tots on the side for $15. I asked about the tator tots and they are the only things fried at that booth so there is no cross-contamination (assuming that the tots are actually gluten-free, I didn’t read the ingredients). I did ask if we could get just a side of tots and that is possible. But they basically just fill the paper boat with tots for $15. So if you want to spend that much money on tator tots, have at it! Right next to the Wild Rice Express kiosk near section 318 is a popcorn stand. They pop it there and then put it into big paper bags. I looked at the ingredients for the oil and Brian and I Googled it and it is not gluten-free. It looks safe because it’s regular old popcorn, but stay away from that! 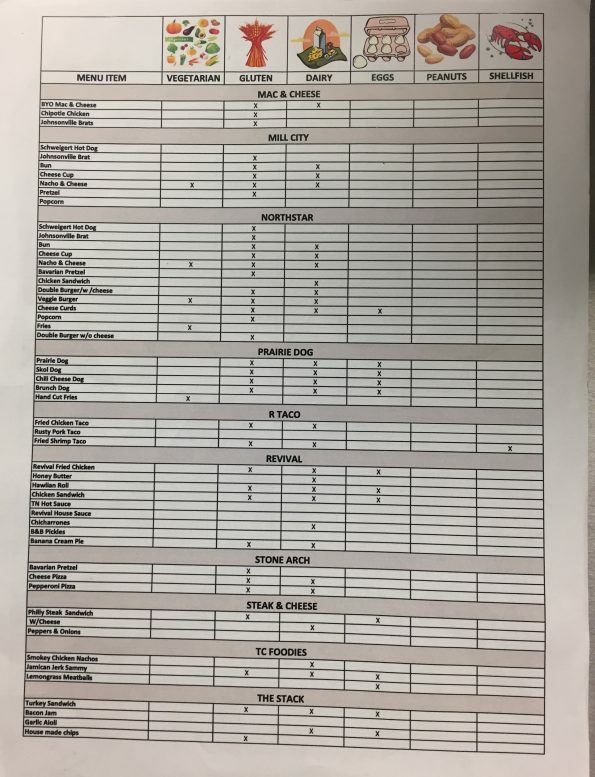 Overall, there are some options, but not a ton and your food experience will definitely be much better if you can eat whatever you’d like. I really wish there would be one safe booth for us where everything is gluten-free and there is no risk for cross-contamination. And perhaps where the employees are trained on allergy protocols. That might hopeful wishing! On that note, SKOL Vikings!